Talking about virtual reality (VR) often calls to mind movies like The Matrix or futuristic video games—however, VR is also proving to be an unlikely ally in the fight to make roads safer in cities everywhere. The World Health Organization warns that by 2030, traffic-related crashes will be the fifth leading cause of death across the globe. In response, city planners, mayors, and urban designers are stepping up to the plate. Practical guide manuals, like the recently released report Cities Safer by Design, take on the challenge of designing safer roads and transport systems, rather than focusing on driver behavior. While urban designers architect road safety, tech developers are working to complement safe road design with the power of virtual reality. Learning to drive as a fledgling teenager isn’t easy, especially when taking your first spin means navigating the busy streets of a major city. In metropolitan areas, motor vehicle crashes are the leading cause of death among the ages of 15 -24 (CDC 2009). To help ease young adults into driving, some organizations are implementing VR driving simulators, giving teens hands-on experience in driving and educating them on road safety precautions. The VR setup at the Children’s Hospital of Philadelphia. Teen D.R.I.V.E. is one such program, letting high school-aged youth hop in the driver’s seat of a “distracted driving” simulator. 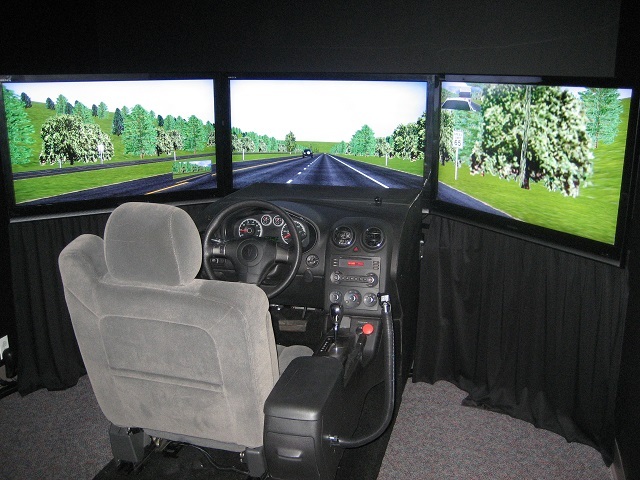 Furnished with large computer monitors, a steering wheel, and car seats, the VR simulators replicate the dangerous experience of driving while distracted (by a phone, eating, etc.). Participants leave the simulation better understanding what it means to be distracted whilst driving, and learn about the increased risk of crashing when not paying full attention to the road. The program travels between schools in Massachusetts, but is only one of many of its kind. Toyota sports a very similar program that works to educate youth on safe driving by utilizing VR. VR driving simulators have also been shown to help children with special needs learn about street crossing and general street safety. A study conducted in Israel by the University of Haifa noted that “children with autism rarely have opportunities to experience or to learn to cope with day-to-day situations. Using virtual simulations such as the one used in this research enables them to acquire skills that will make it possible for them to become independent.” The children of ages 7-12 practiced crossing virtual streets, looking left and right before crossing, and waiting for traffic lights to give them permission to cross roads. By the end of the study, the children’s ability to safely cross the virtual streets had improved significantly, “leveling up” to faster moving traffic and more complex scenarios. With over 90 percent of the world’s vehicle-related deaths occurring in low and middle-income countries, VR as a road safety tool wields extraordinary possibility for rapidly developing cities. And just as VR driving simulators are beginning to flourish in the U.S. and Western Europe, researchers in developing countries are starting to demand that similar, but localized VR models be implemented at home. 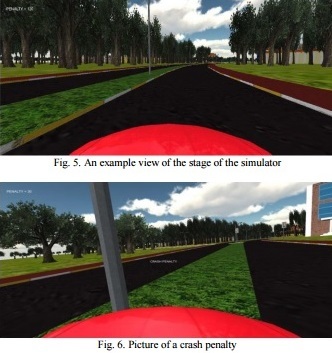 China, Turkey, Malaysia, and many others are publishing reports studying the effects of VR simulators on driving, or calling for their local development. For example, two Turkish computer engineers, Öztel and C. Öz, used a low-cost driving simulator, complete with a steering wheel and projector, to successfully teach participants about safe driving techniques. Their simulator rewarded drivers for completing the virtual courses accident-free and docked points for unsafe driving, such as driving off the road, or hitting obstacles (see figures 5 and 6). 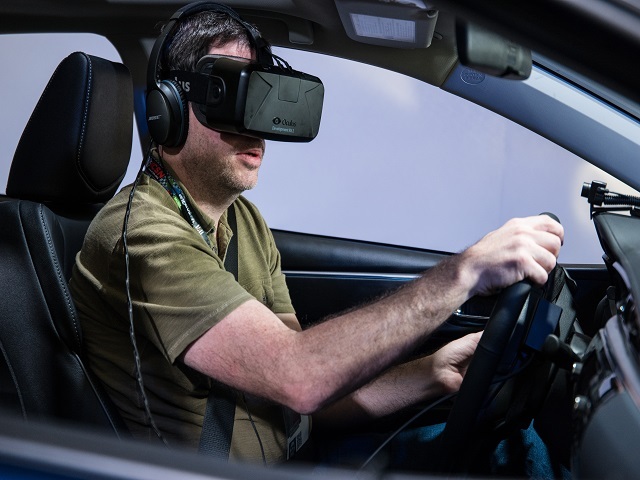 Their research concluded that after completing the VR program, participants learned how to complete the virtual courses and successfully avoid crashes and pedestrians. Using simple, cost efficient setups similar to the one used by Öztel and C. Öz allows for VR simulations to make their way into low and middle-income countries and help cities mitigate traffic accidents. While smarter and safer road designs are being developed and put into place, these developing simulators give countries the chance to train better drivers immediately. Between good design and better trained drivers hitting the streets, the world stands a better chance of saving thousands of lives in the future.